Do Rich High School Dropouts Do “As Well” As Poor College Grads? This, however, is a terrible analysis. First and foremost, it doesn’t live up to his title. Poor kids who do everything right do quite a bit better than rich kids who do “everything” wrong. Only 20% of rich kids who don’t graduate high school make it into the top 40% of income earners. 41% of poor college grads make it into those upper quintiles. Almost 70% of poor college grads make it into the top 60% of income earners. Only 49% of rich HS dropouts do so. The other half of rich high school dropouts end up in the bottom two quintiles, as you’d expect from high school dropouts. Now, nobody will argue that poor kids don’t have an uphill battle from day 1. And nobody will argue that rich kids have a multitude of advantages in front of them. Their path to success is easier. There are many reasons for this, and I’m not going to go into them here, but suffice to say that I agree with the simple premise that it’s harder to succeed when you start out poor. But what the graph that O’Brien uses to prove his point is actually proving that putting your nose to the grindstone, pushing yourself to enter and complete college, is important whether you’re rich or you’re poor. 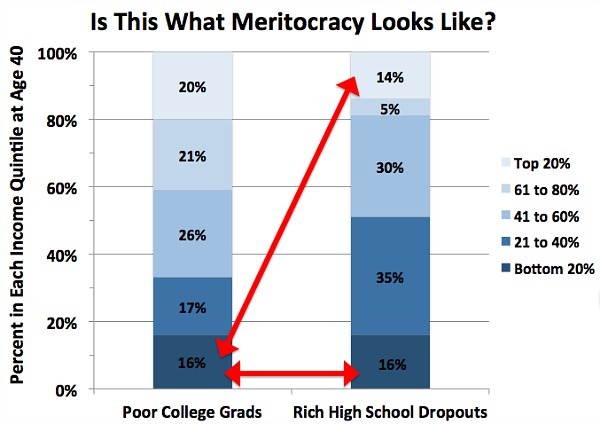 If rich HS dropouts were successful at a higher rate than poor college grads, I might agree with this analysis. But they’re not. Poor college grads do measurably better than rich HS dropouts. 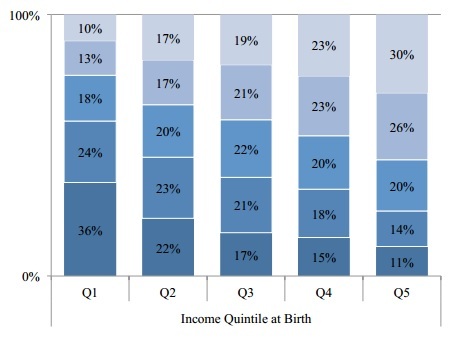 In this chart, you can see that the bottom quintile–60% of them, in fact–stayed in the bottom two quintiles. Only 23% made it to the top two quintiles. And the top quintile–56% of them–remained in the top two quintiles. Only 25% fell to the bottom two quintiles. So overall, completely outside of any educational data whatsoever, the bottom remained on the bottom and the top remained on the top. But if you’re poor, and you graduate college, you flip the script. Your odds are very good to go from the bottom quintile to middle class or better. And if you’re rich but don’t graduate college, your odds are better that you’re going to end up in lower middle class or worse. It won’t hold true for everyone, as there are strong cultural factors in play. But those cultural factors are not overwhelming. Demography DOES NOT equal destiny.